James is such a sweetheart. 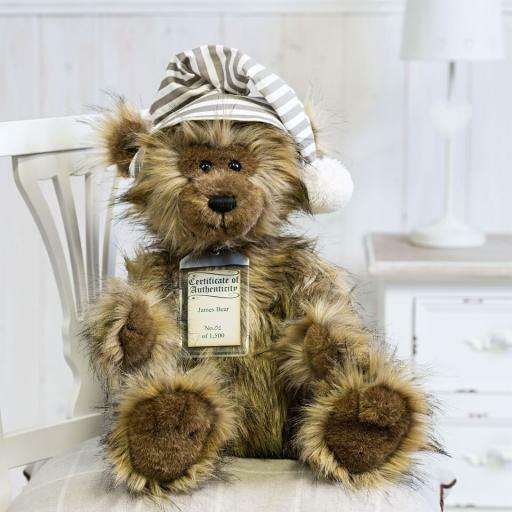 This collectible bear is made of warm mink-coloured plush graduating into darker flecked tips. He has a heart shaped face, muzzle and pads in a complementary warm brown, and subtly defined fingers and toes. His close set black button eyes match his cute embroidered nose. As with all the Silver Tag bears, James is fully jointed, substantially weighted, and has a classic hump. James comes with an individually numbered Certificate of Authenticity. He is 46 cm standing. James is one of 1500. He can be spot cleaned.